I love Christmas decorations, especially the outdoor kind. They bring back some many memories of riding in the car with my family looking a the neighborhood lights as well as going to big holiday displays around town. They are a fantastic way to spread Christmas cheer to all who pass your house. Maybe you’ve never done outdoor decorations before, or maybe you’ve done them for years but it’s always been the same thing and you want to freshen up the look a bit. Whatever the case may be, it can be a very overwhelming task, especially since there are some many great ideas. Because we believe in the power of Christmas cheer, we want to make sure everyone can easily experience it. 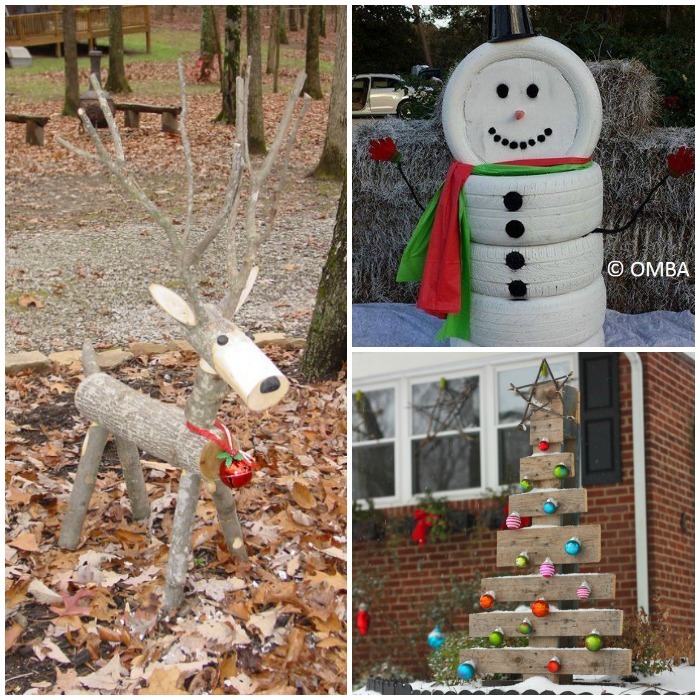 which is why we’ve compiled a list of 18 of our favorite outdoor Christmas decorations. Have some wood scraps lying around? 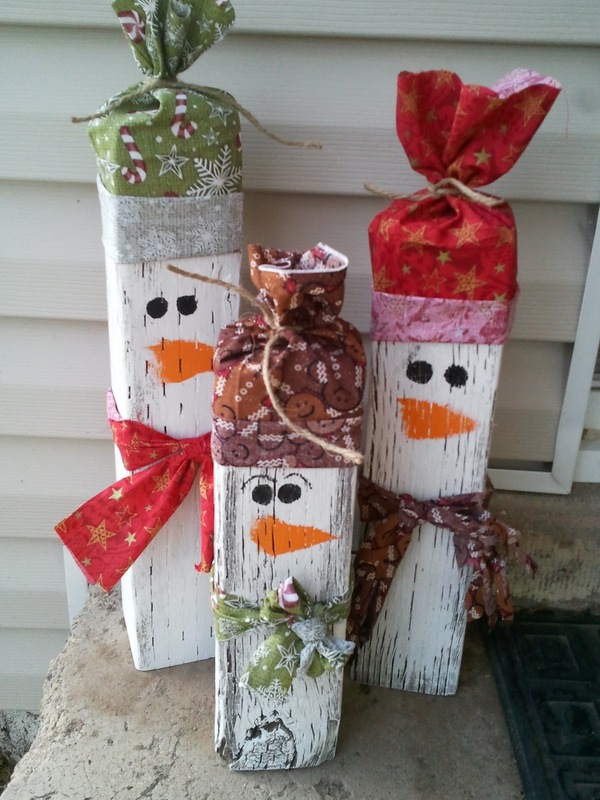 Use them to make these adorable wooden snowmen for the porch. They’re easy and super cute! 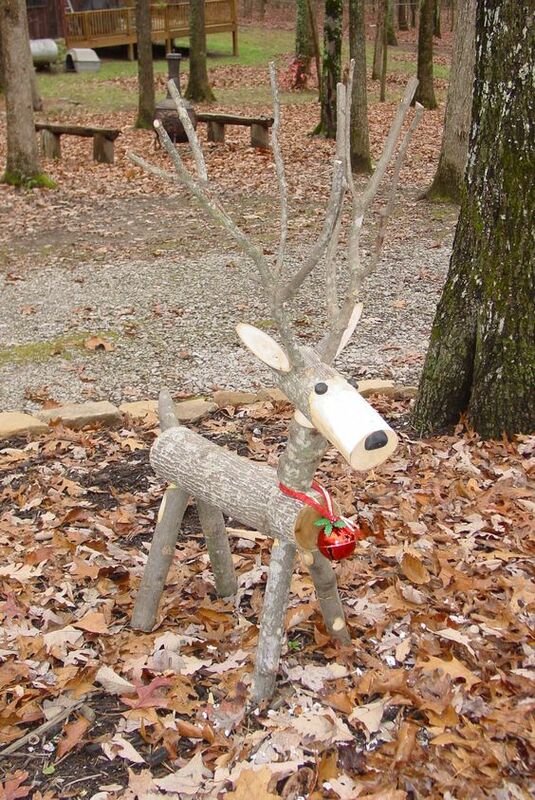 This log reindeer is one of my absolute favorites that I’ve come across. It’s rustic and charming and just plain cute. And speaking of logs, these Santa logs are incredibly easy, too. 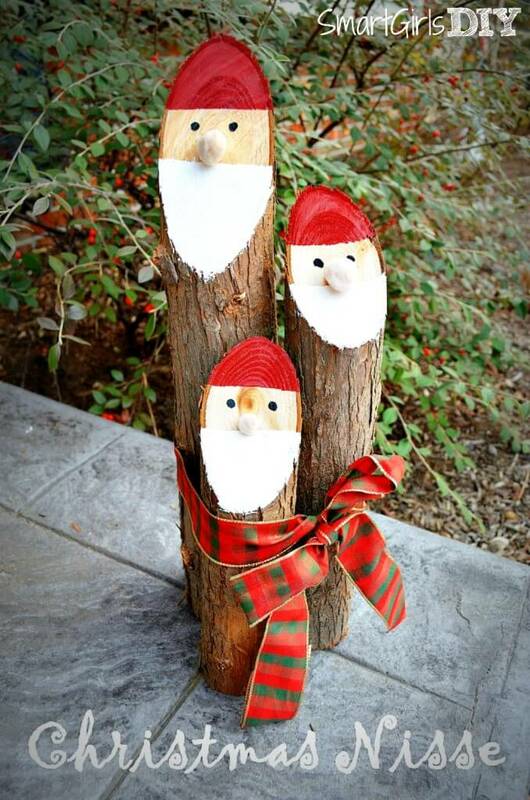 Just pull a few logs from the wood pile, cut one end at a diagonal, and paint the Santa faces on. 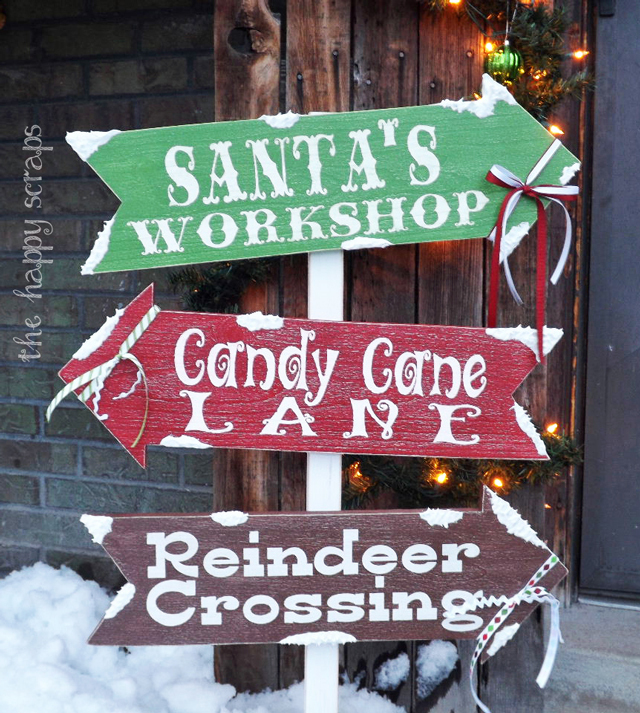 These fun arrow signs remind me of the North Pole. Imagine how cute they’ll look in your snow-covered yard. 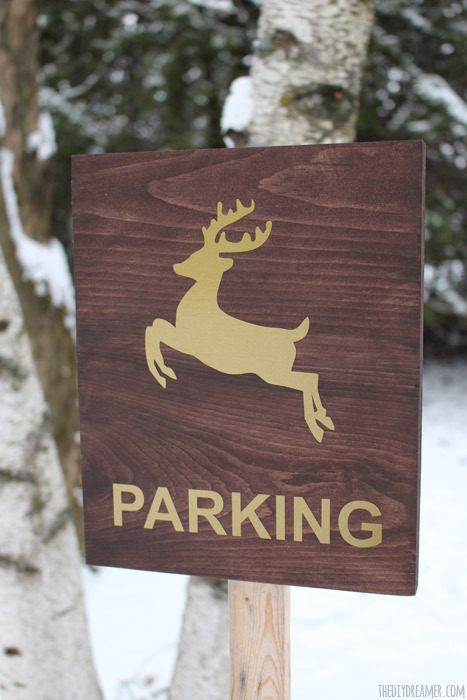 If you have a silhouette (or a simple deer stencil), you can make this reindeer parking sign in a snap! Who knew you could create such a magical effect with chicken wire and strings of lights? 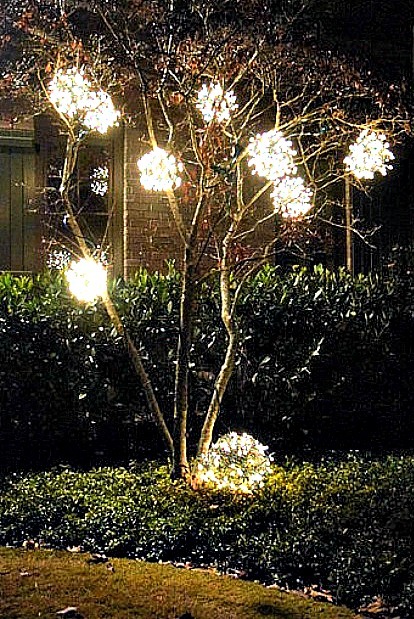 These outdoor lighted ornaments are simply amazing! 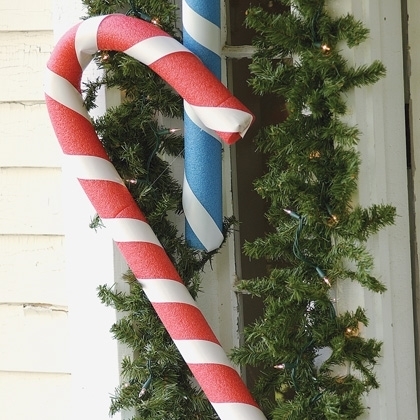 Pool noodle candy canes are super easy. You’ll need a piece of wire to insert in the middle and help you shape the candy cane. To get the stripes, use white masking tape. Simple and GENIUS! PVC pipe projects are right up our alley. 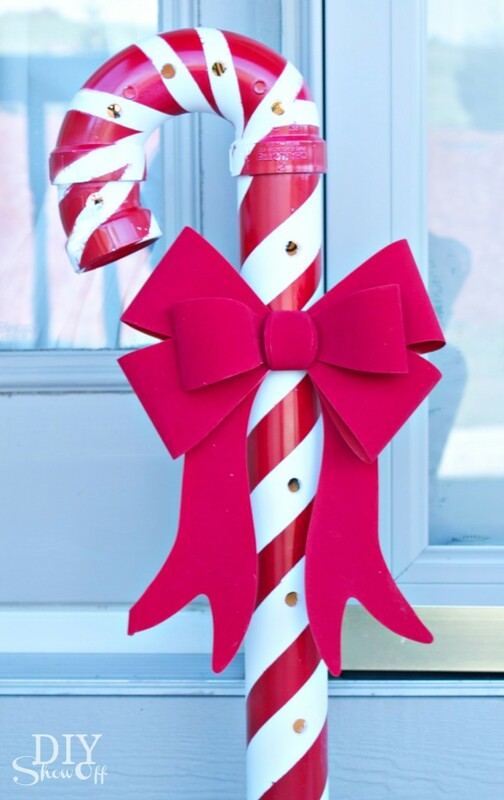 We quickly fell in love with these lighted pvc candy canes. Take a look and you’ll see why! 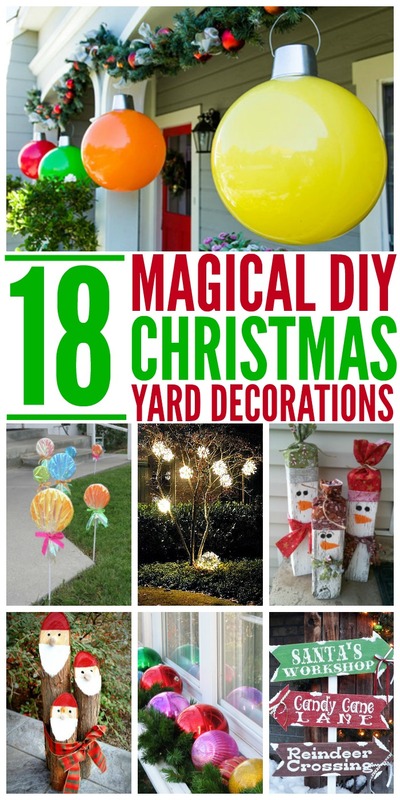 With a few large plastic balls and silver pails, you can make yourself some of these gorgeous giant outdoor ornaments. These are on my to-do list for sure! 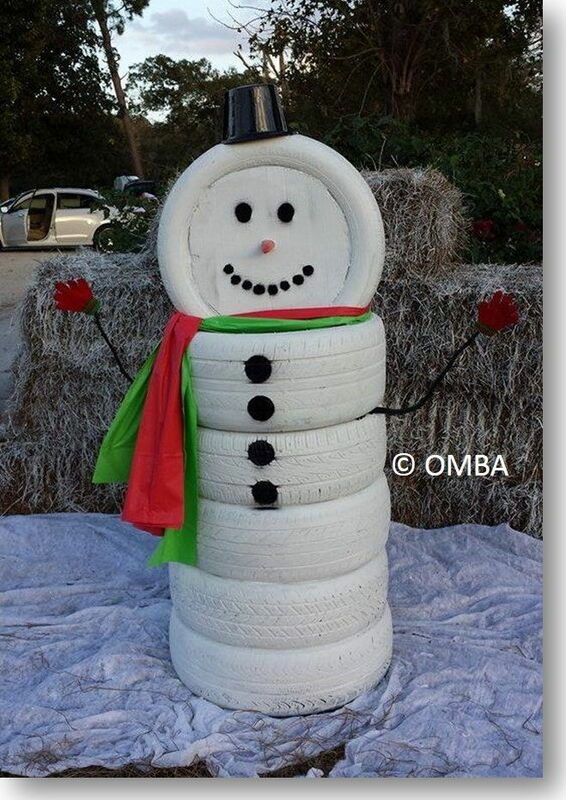 These tire snowmen were really common in the small town I grew up in, so I had no idea they were such a big hit online! Make the scarves with plastic tablecloths from the Dollar Store. 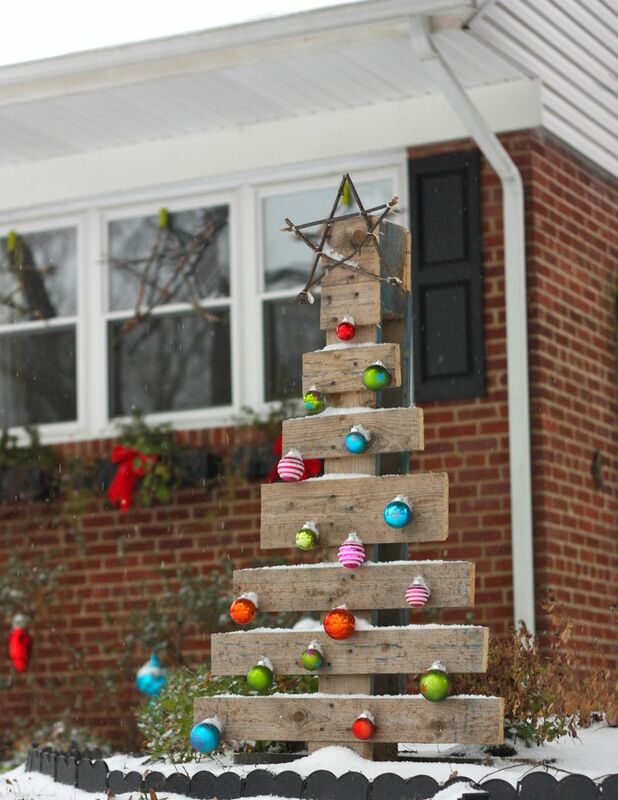 You’ll fall in love with the rustic look and simplicity of this pallet Christmas tree. Want more pallet Christmas decorations? We’ve got ’em! This JOY wreath is simply breathtaking. 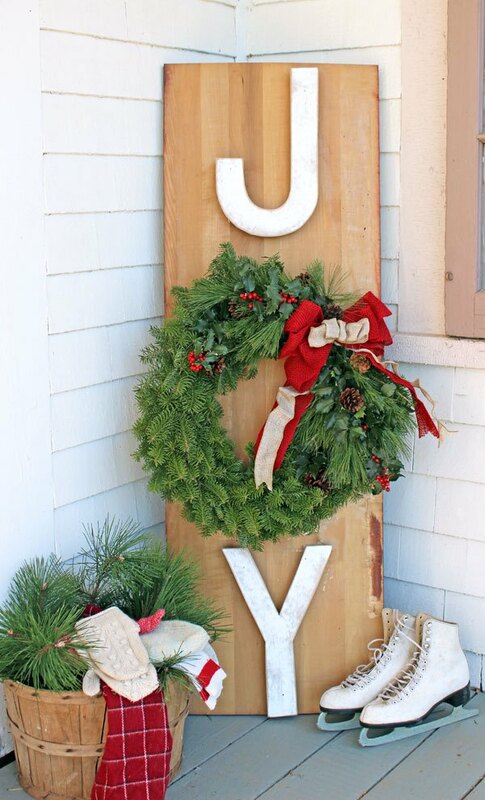 With a plank, some large wooden letters, and a wreath, you can recreate this look on the cheap. 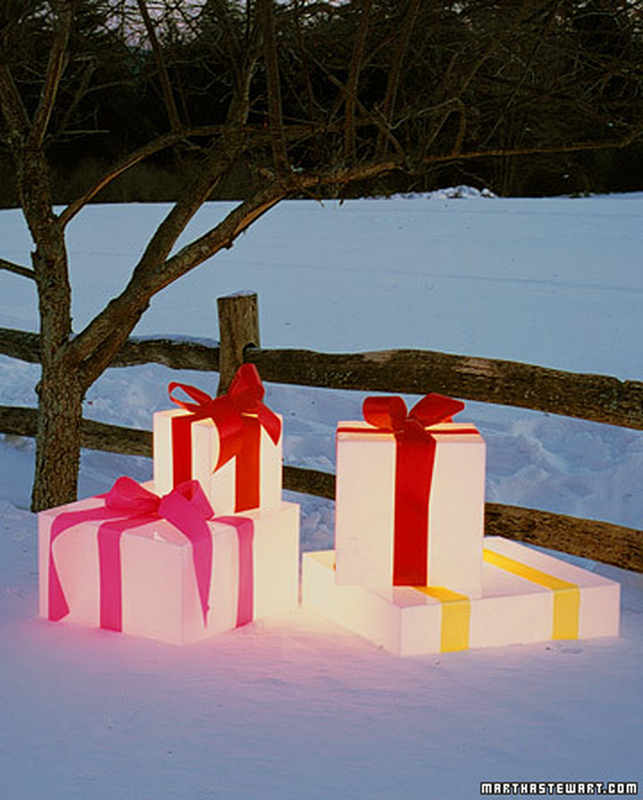 Build some glowing gift boxes out of plastic boxes, battery powered lights and some ribbon to make pretty bows. 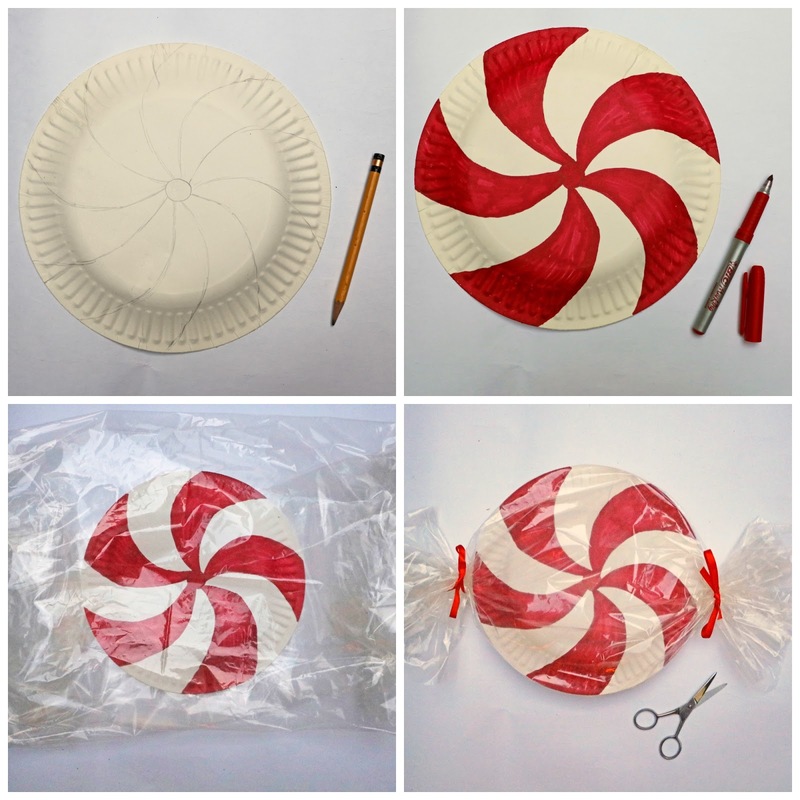 Staple these paper plate peppermint candies to some simple stakes put them in the ground, and voila, you have yourself a candy land in your own backyard. 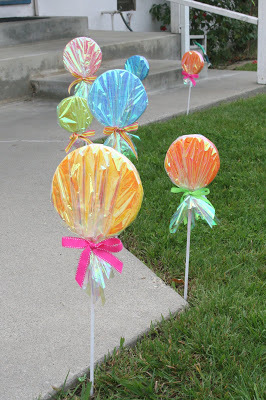 Speaking of a candy land, you’ll need these giant lollipops as well. 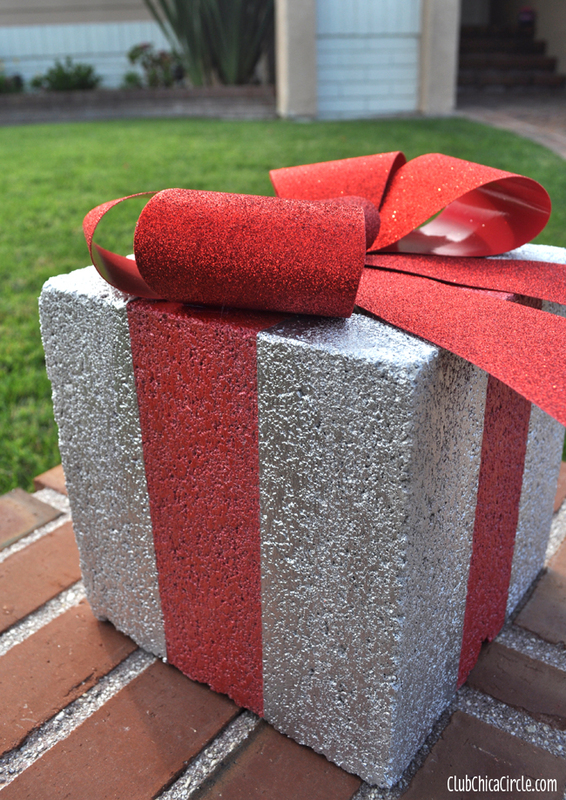 Turn concrete blocks into gift boxes that you can reuse from year to year. This is the perfect idea for our yard since we get a lot of wind in the winter time, and lightweight decorations just blow away. 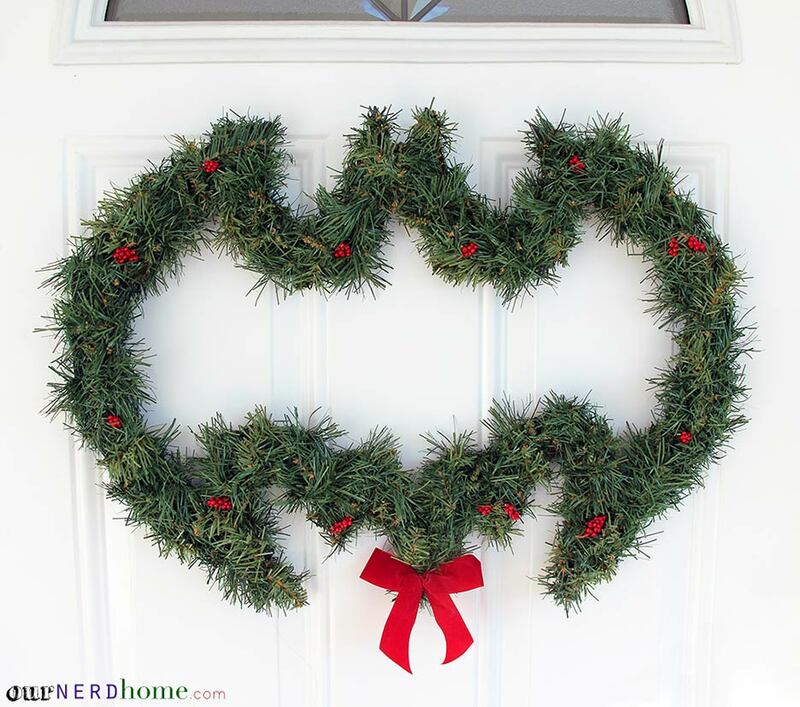 This Batman wreath will make any superhero fan holly jolly! 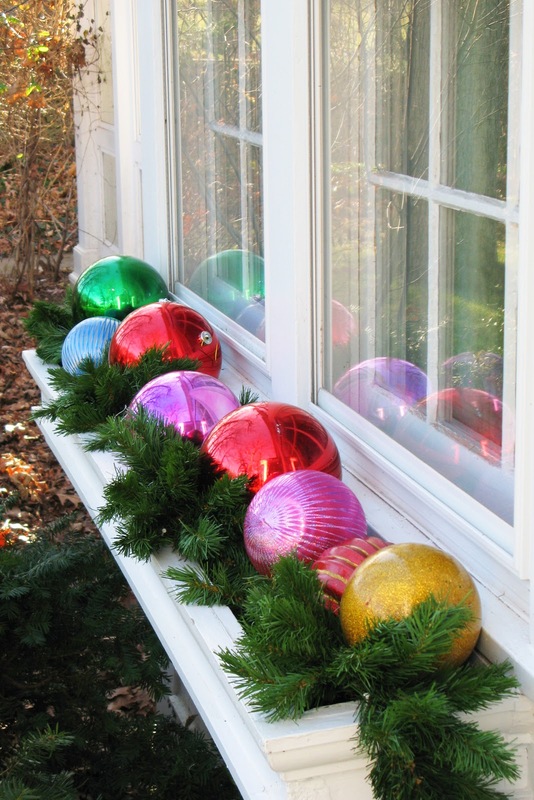 Fill your window box with ornaments to liven up the outside of your windows. Add ornaments to all of your garden boxes and baskets. They’ll look lovely and full of color! Don’t let the Grinch steal your Christmas. Help you neighborhood remember the magic of the season by putting up decorations that will light up your yard and warm the hearts of everyone who see them!